For more than 80 years, we've made it our business to give our customers peace of mind by making their insurance experience easy and convenient. 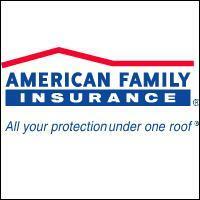 American Family Insurance understands you are looking for a relationship with a stable and trustworthy company. You want an expert, caring advisor who works toward making your insurance experience easy and convenient. An advisor who ensures there are no unwelcome surprises and peace of mind, especially in your time of need. Our knowledgeable agent advisors provide auto, home, life, health, business, and farm & ranch insurance. Flexible Payment Options, Competitive Rates, Discounts Available 19 States Served: WI, IL, MN, IA, MO, IN, OH, GA, ND, SD, NE, KS, CO, AZ, UT, NV, ID, OR, WA Quality Service Local Agents Residential & Commercial Emergency Service Visit http://www.amfam.com/security/identification.asp for product offerings by state. No reviews were found for American Family Insurance.